Eating like a farmer means preserving fruits and veggies when they are comin' in hot and heavy from the fields, so you can save + savor the bounty all year long. So while pickling, fermenting, kombucha-making, and jamming are all the rage these days - let's be clear that these methods of food preservation have been going down in farmhouse kitchens for a long, looooong time. So let's talk about jam. I won't claim to be an expert jam-maker, but I DID manage to make 200+ jars of small-batch jam for our wedding guests back in 2014, and no one perished from botulism, so I suppose that's something... right? And while entire books (and great blog posts, like this one) have been written about jamming, I'm going to briefly summarize the basics + share some tips and tricks I've developed after countless hours jamming out over the stove. 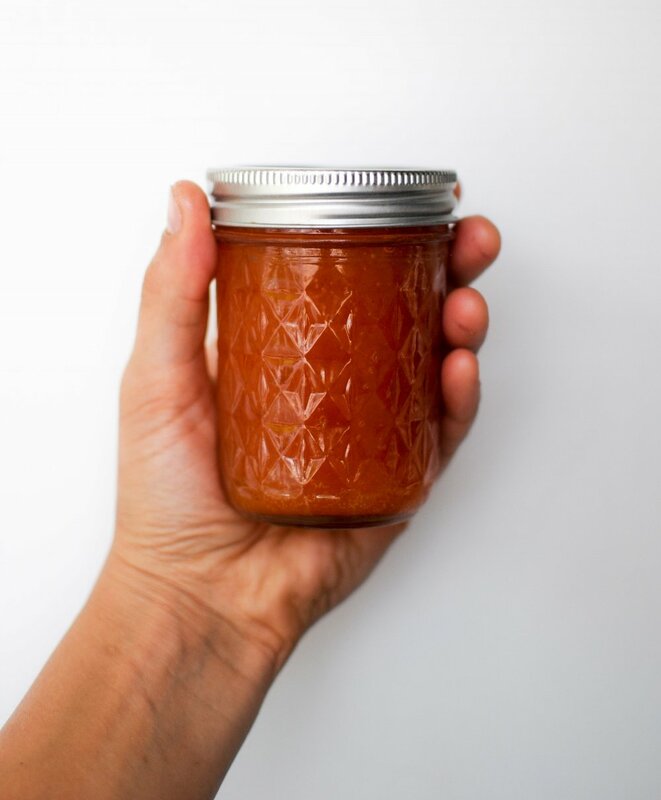 Keep scrolling for a recipe (adapted from Serious Eats) for sunshine in a jar... aka Apricot Jam. Pectin is a carbohydrate that helps to ‘set’ jam. It is particularly concentrated in the skins and cores of fruit. I should note here that I do not add store-bought/commercial pectin in my jam recipes, and instead rely on the naturally occurring pectin in fruit + lemon juice for acidity to help the fruit set. Pectin, whether naturally occurring or added, requires heat, sugar, and acid to activate. Low-pectin fruits benefit from lemon juice to boost the acidity and setting of the jam. Unripe fruit will also increase acidity. Avoid making jam with overripe fruit, because as fruit ripens the pectin begins to break down. Weigh your fruit. Take half the weight of the fruit and use it as your sugar measurement. Use as many ounces of lemon juice as you used pounds of sugar. For example, if you are making strawberry jam with 4 lbs strawberries, use 2 lbs sugar, and 2 ounces of lemon juice. 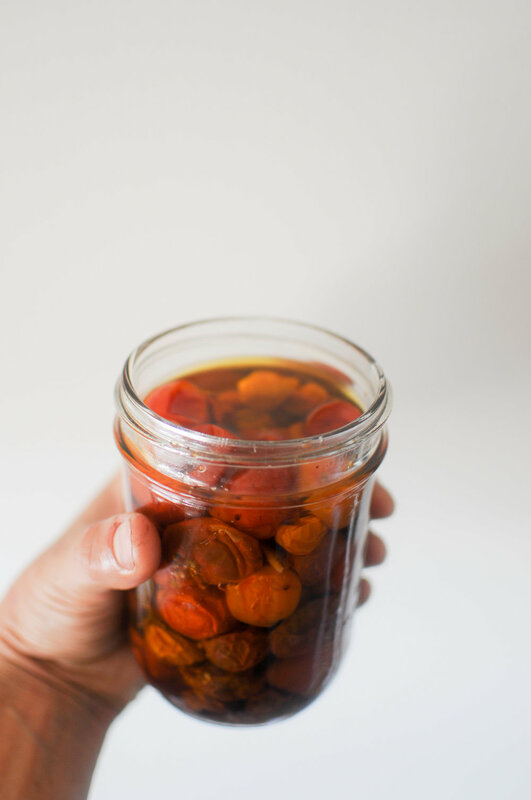 Any time you are preserving food, it's super important to use sterilized jars. You can sterilize jars by putting them in a 225F oven for 20 minutes. Once sterilized, turn the oven off and leave in the warm oven until the jam is ready. Jars and lids can also be boiled for 10-15 minutes in a large saucepan of water, then dried in the oven at a low temperature. Use a non-reactive pot like stainless steel, enamel, or copper when making jam. Use tempered jars that can withstand the temperatures involved in sterilizing, jam-making and storage. In the non-reactive saucepan that you plan to make the jam, combine apricots, sugar, and lemon juice and mix until all the sugar is moistened. If some sugar remains dry, allow to macerate until fruit has released enough juices to moisten sugar, 5 to 15 minutes. At this point, you can blend the fruit-sugar mixture with an immersion blender if you woul like the finished jam to have a smoother texture. For more rustic jam with pieces of fruit, leave as is. Set a small plate in the freezer. Plae the pot on the stove and heat over medium-high heat, stirring regularly, until sugar is melted and mixture starts to bubble, 10 to 15 minutes. Heat apricot mixture over medium-high heat, stirring with a flat wooden spoon as needed to prevent burning, until jam starts to foam, about 15 minutes. Continue to cook, stirring to prevent burning, until foaming has subsided, about 15 minutes longer; scrape any foam off jam surface with a stainless steel spoon as needed. Taste the jam (carefully.. it's HOT!) - there should be a balance of sweetness and tartness. Make small adjustments (ie more sugar or lemon juice) if needed. Continue to cook until bubbling has slowed and jam looks glossy and jam appears thickened around the edge, 10 to 15 minutes. Lower heat as necessary to prevent scorching. Turn off heat and set a dollop of jam on the small plate waiting in the freezer - allow it to sit in the freezer for a few minutes. The jam is ready once it holds together wrinkles when you push it with your finger. If jam is too runny, return to heat and cook, stirring frequently and repeating the spoon test every 5 minutes, until jam passes the "wrinkle" test. Fit sterilized jars with a wide-mouth funnel. Ladle jam mixture into jars, leaving 1/2" headspace. Take a clean towel and wipe the rims of each jar. Put lids and rings on jars and tighten. At this point, jam may simply be kept refrigerated, up to 1 month. To process jars in a hot water bath: have a large stock pot filled with water and ready at a rolling boil by the time you are filling jars with jam. Place filled jars with tightened lids into the boiling water one at a time, using a jar lifter or tongs. Keep jars upright at all times. Add more boiling water, if needed, so that water covers jars by at least 2 inches. Increase heat to high and cover. Once water begins boiling, heat jars for 15 minutes. Turn off heat and gently transfer jars out of the stock pot and onto your counter to cool. Avoid placing jars on a cold surface or near a cold draft. Let jars sit undisturbed until fully cooled. Check to make sure all jars have sealed by pressing your finger to the middle of the lid (if sealed, the lid will not pop).